I’m now living my first winter in my Civil War log cabin heated primarily by a wood stove in the mountains of western North Carolina. I absolutely embrace living this way and enjoy the peace and serenity. The atmosphere here is perfect for making music, and I’m playing more than I have since I was a teenager. However, the dryness of winter and the wood stove have made it impossible for me to keep my guitars hanging on the wall; even with three “whole house“ humidifiers running. Feeding them 12 gallons of water a day, I cannot get the cabin to stay above 20%. This comes as no surprise to me as for years I’ve repaired cracks in the guitars of people that heat with wood, and forced hot air is just as bad. I have had to begrudgingly resort to keeping my instruments in their cases this winter, where they can be protected by D’Addario Humidipaks. These wonderful inventions originally come to us from NASA. They maintain a consistent 45% humidity by either emitting or absorbing moisture. That said, I really don’t like having my instruments hiding their cases. Here’s why. my life, I’ve been able to do this because I have lived in modern homes that were built tight, so a quality room humidifier was all I needed to keep my babies safe. This winter, that’s simply not the case. if I want to play a guitar, I have to search for the right case, twisting three or four latches, remove the Humidipaks, then tune it up and make sure nothing’s wrong–all the while hoping the original burst of inspiration is still within me. In practice, I’m mostly playing my carbon fiber guitar that hangs ten feet from the wood stove without issue or complaint. I recognize this is a first world problem, but even though the carbon fiber X20 is a fine guitar, it doesn’t inspire me like my McConnell or Mountain Song baritone. So if you keep your guitars in cases and you’re finding that they don’t get enough sunlight, I’d like to suggest you find a way to keep them out and within arm’s reach. Just try it see how much more you play, and how much more you smile. There are several ways I’ve achieved this over the years. 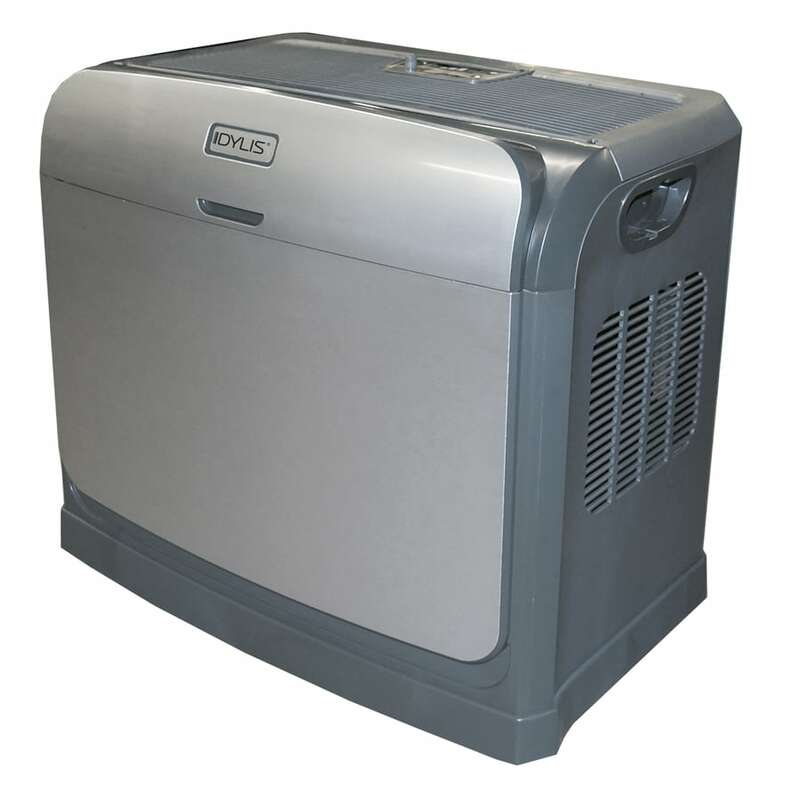 If you own your home, for about $1,000-1,500 you can install an evaporative humidity system directly to your furnace. This is by far my favorite approach. It’s a healthy humidity, it saves you having to carry water every day, and there are huge benefits to the human body having moisture in the air around us. Depending on where you live, in the summertime you simply disconnect the unit. All winter you’ll sleep better, feel better, and your guitars will too. If you don’t own your home, or for any reason cannot install the above, get a quality whole house humidifier, even if you’re only humidifying one room. Don’t believe the square footage that they tell you they will cover. They will not! Make sure that it has a automatic humidity sensor so that you can set the percentage you want and forget about it. 40 to 50% is the range you want all year long. I would also get one that holds the most possible water, five or six gallons. You’ll be amazed how much water it takes to keep the room at 45%. If you have just a few guitars, a great option is a humidified display case like our friends at American Music Furniture (http://americanmusicfurniture.com/humidity-matters/) offer. These are not only gorgeous pieces of furniture, but they can maintain a perfect environment for your dream machines. Since your instruments will still be in plain sight, you will continue to grab them all the time. Another big benefit of having your instruments visible is that you’ll be able to take better care of them. When a minor issue arises you can deal with it then, rather than two years later when you open the case to discover a major problem. There are so many guitars that have been decimated after being stored in the case for long periods. Dryness and inconsistent temperature are serious problems: just ask my repair team. If your only option is to to keep your guitars in their cases, you should definitely use something like the D’Addario (https://www.dreamguitars.com/shop/guitar-accessories/humidification.html) solution and force yourself to take them out and play them. They miss you. For me, I need to do some more research to create a safely humid environment in my ancient Civil War cabin, so I can grab whatever instrument I need when the moment strikes!